Chris J. Bickerton is associate professor of international relations at Sciences Po, Paris. He has published widely on EU foreign policy issues, including a monograph published in 2011 with Palgrave-Macmillan, entitled EU Foreign Policy: From Effectiveness to Functionality. His most recent work is on state transformation and European integration. This will be published as a book with Oxford University Press, entitled European Integration: From Nation States to Member States. Chris Bickerton is also the co-author of the political economy blog, The Current Moment. The recent decision by the Nobel peace prize committee to award the 2012 prize to the European Union was grist to the mill for those arguing that the EU’s foreign policy has been a great success. Though the committee was thinking more of the EU as an internal peace project for Europe, it did also highlight the EU’s role in building peace through its Eastern enlargement, completed in 2004. More generally, the prize was seen as reinforcing an idea many have of the EU: as a spreader of norms, of rules, of democratic values and – ultimately - of peace. Typically, given the EU’s uncertain existence as an institution that is neither a state nor simply an international organization, the award of the prize was double-edged. As a consequence, an unseemly battle over who should collect the prize broke out within Brussels and across national media in Europe. Some felt that a “great European” in the tradition of Robert Schuman or Jean Monnet should collect the prize. For the French, this was Jacques Delors; for the Germans, it was Helmut Kohl. Others preferred to push to one side altogether Europe’s grubby political class, suggesting instead that twenty-seven children from each of the member states could collect the prize. The EU’s aspiration towards peace could thus be captured in the innocence of its multi-national children. In the end, a more prosaic bureaucratic compromise has been settled upon. The heads of the EU’s three main institutions – European Council, European Commission and European Parliament – will together collect the prize in the name of the EU. This story, interesting and amusing on its own terms, also points to a number of features about the EU’s foreign policy and about the EU generally. It is striking that as soon as one tries to evaluate the EU’s capacity to build peace internally or to export it beyond the EU’s borders, one ends up debating the nature of the EU itself. For some, this reflects a terrible Euro-centrism and narcissism on the part of those involved in EU affairs. Why keep asking about the nature of the beast when we could be looking at what the EU does and asking whether it does it well or not? It may be that those interested in EU affairs are narcissists but the problem is not one of individual psychology. Rather, a peculiar feature of the EU is the manner in which its policymaking procedures overlap very closely with concerns of polity-building. The separation between action and ontology is an uncertain one, reflecting the nature of the EU as an unsettled political order. Looking specifically at the EU’s foreign policy dimension, this overlap between policymaking and polity-building means that it is unwise to ask whether the EU’s foreign policy has been a success or not. This only begs the question of what standard of success we are using to make this assessment. To compare the EU’s foreign policy to that of national foreign policies is to treat the EU as a state, an assumption some make but one that leads to an inevitable sense of disappointment and dissatisfaction with what the EU actually achieves. If we are to restrict ourselves, in a pragmatic fashion, simply to the outputs of the EU’s foreign policy, then here again we are likely to be disappointed. Though the EU has undertaken over twenty security and defence missions since 1999, none can be said to cement the EU’s role as a key strategic player in contemporary international politics. The EU’s 2003 Security Strategy was long on ideals but short on strategy. It was driven as much by the need to demonstrate European unity after the divisions over Iraq as it was by a clear strategic rationale. Moreover, to look only at outputs is to miss much of what is significant about the EU’s foreign policy. If the outputs are relatively modest, why has so much been made of the EU as an emerging international actor? Why so much attention to a policy area that bears so little fruit? The answer can be found in the various functions EU foreign policy plays within the wider process of European integration. In this respect, the foreign policy dimension is not fundamentally different from other parts of the EU policymaking machine. Ultimately, the policymaking process is subordinated to a number of other goals, some of which are rather distant from the actual substance of the policy process itself. Giandomenico Majone has observed that much EU policy appears “epiphenomenal”; that is to say, it is undertaken in order to meet another set of goals, which in his mind are bound up with the political project of European integration. This is what Majone calls “integration by stealth”: the pursuit of political goals via the seemingly technical questions associated with maintaining European fish stocks, propping up its dwindling agricultural industry, and regulating environmental standards across the whole Union. A reason why many of these policies are so dysfunctional is that they are only indirectly designed to deal with the problems at hand. Majone lays rather too much emphasis on the pro-European faith of EU and national officials. His image is rather conspiratorial: of convinced Europeans seizing on any opportunity presented to them to pursue their political dream of a united Europe. In the case of foreign policy, the strength of internal functionality certainly drives foreign policy-making but it is not simply an internal desire for “more Europe”. Rather, three key functions stand out that help us understand how EU foreign policy operates, why it is important in spite of its meagre achievements and why there is so much interest in it. The first function is the retreat from power politics by Europe’s member states. The second is the management of institutional conflicts and rivalries. The third is the creation of a European identity through foreign policy in order to meet some of the EU’s legitimacy problems. That Europe as a whole is undergoing a slow process of demilitarisation accompanied by a retreat from great power politics is well-known. Already in the early 1980s, when the UK fought Argentina over the sovereignty of the Falkland Islands, its military success was due only to the speedy military support provided to it by the United States. A function of the EU’s foreign and security policy is to allow member states to make this retreat without seeming to abandon altogether a foreign policy role. 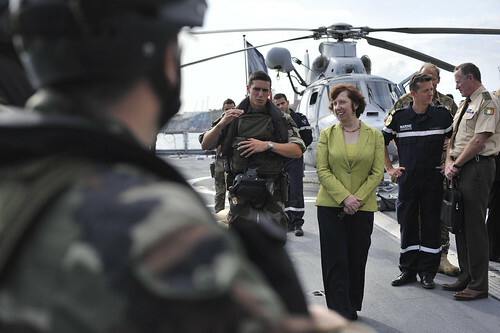 CSDP is thus taken as evidence of a continued European commitment to international affairs. It is certainly true that this function operates more in some national cases than in others. Germany’s difficult position of being so central to the world economy and yet retaining a political preference for a minimal role in international security has been managed via CSDP. In the British and French cases, EU foreign policy has been on occasion used as a façade behind which national interests are pursued. But these remain exceptions to the rule. In general, European member states support CSDP as a substitute for more burdensome and costly national strategies. The management of institutional rivalries is central to the EU’s foreign policy. Strategic priorities and goals, and institutional developments, are rarely uncoupled from the desire to maintain a balance between different EU institutions. The European Parliament in particular, ever looking for opportunities to expand its institutional influence and power, has used foreign policy as an area where it can flex its muscles. Demanding oversight powers and highlighting the expertise of its MEPS, it has strengthened considerably its foreign policy role. In particular, it has focused on certain themes – democracy promotion and the defence of human rights – that are deemed useful in developing its own institutional identity. The recently created European Action Service is another example of an institutional change that has served as a way of regulating relations between different centres of power in Brussels and between Brussels and national capitals. Indeed, the EAS’s own evolution seems to owe more to the play of institutional conflicts than it does the implementation of a rational institutional design. Finally, in terms of identity-building, the emphasis on EU foreign policy reflects the exhaustion of other European narratives. From having been a bulwark against the spread of communism, the EU gradually became associated with individual welfare enhanced via the single market and as a site for the unity of Western and Eastern Europe. These economic and cultural themes found themselves complemented in the 2000s by the idea of the EU as a challenge to US hegemony. More popular on the Continent than in the UK, this idea of the EU was fuelled by criticisms of the United States as a “hyper-puissance”. Especially around the time of the split between “old” and “new” Europe on the question of intervention in Iraq, the notion of the EU as a kind of international actor that was fundamentally different from more traditional military powers began to gather steam. Popular already in the 1970s with the notion of “civilian power”, this idea had fallen from favour as détente gave way to the second Cold War of the 1980s. A reassertion of American unilateralism under George W. Bush gave Europeans the opportunity to cultivate once again their distinctive international identity. The US do “regime change” through military interventions, argued British diplomat Robert Cooper in 2004, whereas the Europeans do it “through law”. US writer, Robert Kagan, coined the term “Americans are from Mars, Europeans are from Venus”. European academics, taking umbrage at this vulgar deployment of Roman mythology, preferred to think of the EU as a “normative power”. Coming as this all did at a time of profound internal political malaise for the EU, where its constitutional process had been derailed by the Dutch and the French in two key ‘No’ votes in mid-2005, many turned to the EU’s external role as a source of identity and legitimacy. At a time of economic and financial crisis for the Eurozone, attention has turned away from the EU’s foreign policy. No new CSDP missions have been launched in recent years and the pursuit of an EU identity via its foreign policy has abated. The institutional rivalries managed through foreign policy are today also managed through reform of macro-economic governance of the Eurozone. Nevertheless, it remains true that the drivers of the EU foreign policymaking process as much to do with these internal functions as they are to do with external challenges and matters of strategy. For that reasons, asking if the EU’s foreign policy is successful is less enlightening that asking what this policy area is for. Article originally published by Eyes on Europe. Chris J. Bickerton (2011) EU Foreign Policy: From Effectiveness to Functionality. Basingstoke: Palgrave-Macmillan. Robert Kagan (2003) Paradise and Power: America and Europe in the New World Order. London: Atlantic. Giandomenico Majone (2005) Dilemmas of European Integration: The Ambiguities and Pitfalls of Integration by Stealth. Oxford: Oxford University Press.